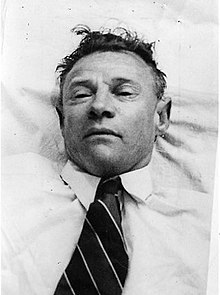 The Tamam Shud case, also known as the Mystery of the Somerton Man, is an unsolved case of an unidentified man found dead at 6:30 am, 1 December 1948, on Somerton beach, Glenelg, just south of Adelaide, South Australia. It is named after the Persian phrase tamám shud, meaning "ended" or "finished", printed on a scrap of paper found months later in the fob pocket of the man's trousers. This page was last changed on 4 September 2018, at 04:30.